Through the windows of our spacious, clad-in-pinewood hotel room, I observed an idyllic picture of hilly green pastures with flocks of sheep whose faint bleating and tinkling bells could be heard in the clean mountainous air. A state-of-the-art Galzigbahn cable car will soon take us to the top of Valluga Mountain (2811 meters), where from a 360-degree sightseeing platform the Alps in four different countries—Austria, Germany, Switzerland, and Italy—can be seen. Back in 1937, the Galzig cable car was one of the first gondolas in the region. The new contemporary lift is based on the technology of a Ferris wheel, letting the passengers embark and exit at ground level. Our discovery of Tirol, Austria, started with a Lufthansa non-stop flight from San Francisco to Munich. From there, it was an easy ride with car-and-driver transportation service Four Seasons Travel (the office located right at the airport). 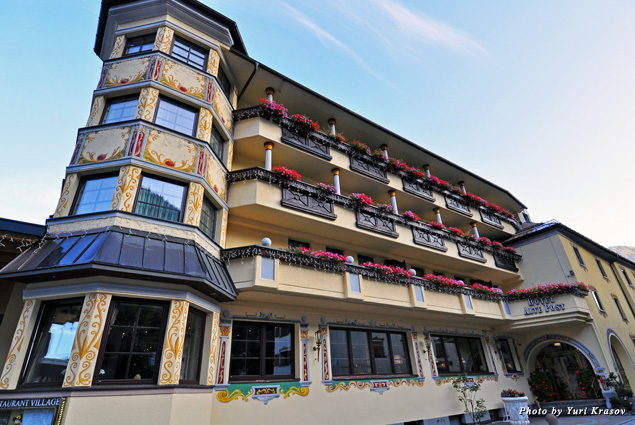 Soon my husband and I were in Austria and were greeted warmly at the charming Hotel Alte Post in the beautiful little town of St. Anton am Arlberg, one of the 12 “Best of the Alps” most traditional Alpine resorts in Europe. 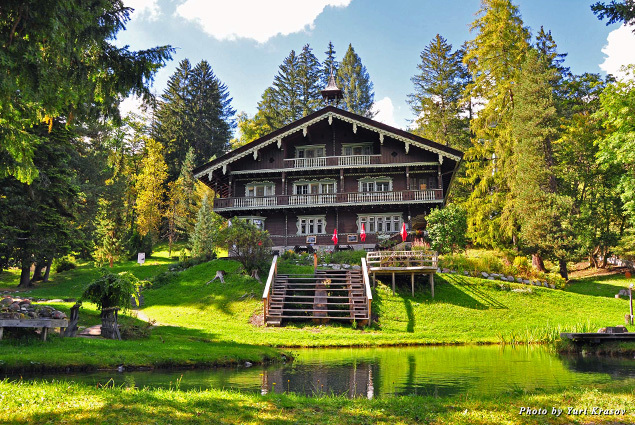 A local museum dedicated to the history of St. Anton tells the story of Hannes Schneider, the Arlberg ski pioneer who founded the world’s first ski school in 1920. In his St. Anton ski school, which still exists today, Schneider introduced the “Arlberg technique” to international audiences. In 1938, the Nazis imprisoned Schneider for repeatedly speaking up against the Nazi regime and supporting Jewish friends. Thanks to international pressure he was soon released; in 1939, he immigrated to the United States, where he established a famous ski school in New Hampshire. A ski resort with a worldwide reputation, the clean, cheerful, and well-groomed St. Anton is so small that on the next day we were greeting our new acquaintances on the streets, including the owner of Pete Café-Restaurant, where we ate Tiroler Gröstl, a mixture of fried potatoes, onions, and shreds of meat and sausage topped with a sunny-side up egg and scallions, for lunch. 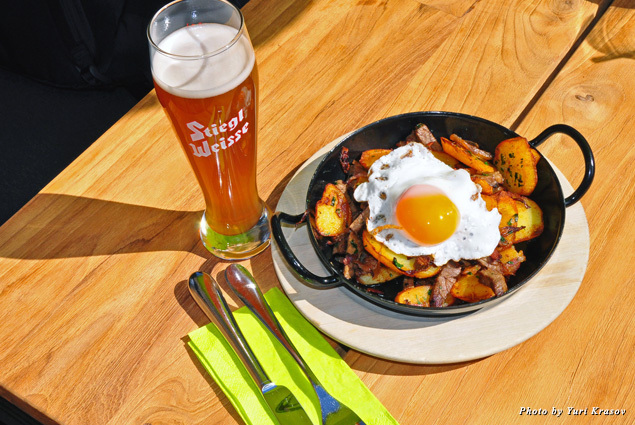 This simple and delicious dish is very popular in Tirol and is served in any restaurant, as we discovered on further travels through the region. 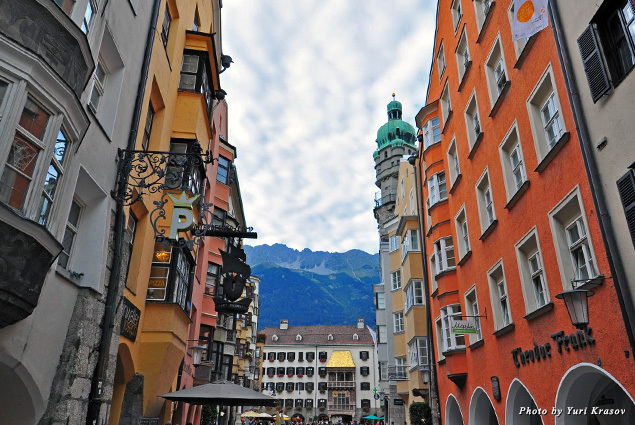 In Innsbruck, the mountains come up closer to the city—cold and severe, with snow-covered tops. 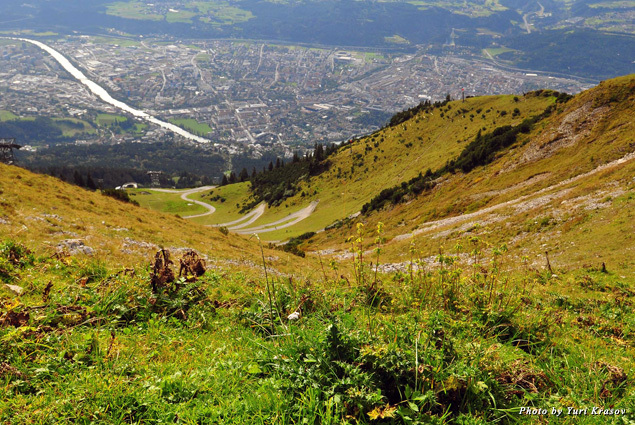 Here, we ascended to the wind-swept heights of Seegrube (1905 meters) and Hafelekar (2300 meters) in a funicular and two cable cars, to get a look at the endless mountainous country and the city below, traversed by the jade-colored River Inn. Chilled to the bone from a close encounter with the North Chain mountain range, I indulged in a warm Kasspatzl’n mit Roestzwiebln (cheese spaetzle with roasted onions) at the oldest city restaurant, Weisses Roessl, founded in 1590. This slow-food restaurant serves all the farm-to-table traditional specialties stemming from Austrian, Hungarian, and Bohemian culinary roots. We explored the Old Town and its historical landmarks: Goldener Dachl, a golden roof built for Emperor Maximilian I (1459-1519) over a balcony from which he liked to observe the knights’ tournaments; St. Anne’s column, commemorating a 1703 Tyrolean victory over Bavarian troops; and a contemporary outdoor artwork of orange banners listing the names of Austria’s courageous citizens who raised their voices against the Nazi regime during WWII. 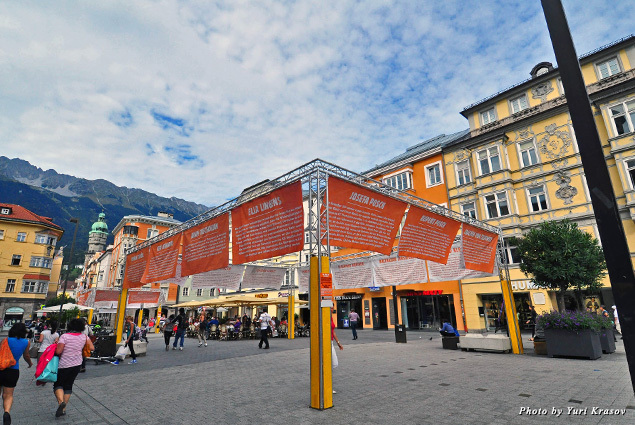 For a relatively small city of about 125,000 people, Innsbruck has an impressive number of museums. At Kaiserliche Hofburg (the imperial court palace), the Hofkirche (the court church) contains Emperor Maximilian I’s enormous tomb adorned with marble reliefs and surrounded by 28 larger-than-life bronze statues of the Emperor’s ancestors and heroes of antiquity, with three figures designed by Albrecht Durer. A collection of arms, arts, and wonders of nature can be seen at Schloss Ambras. Tiroler Landesmuseen has a series of permanent art exhibitions. 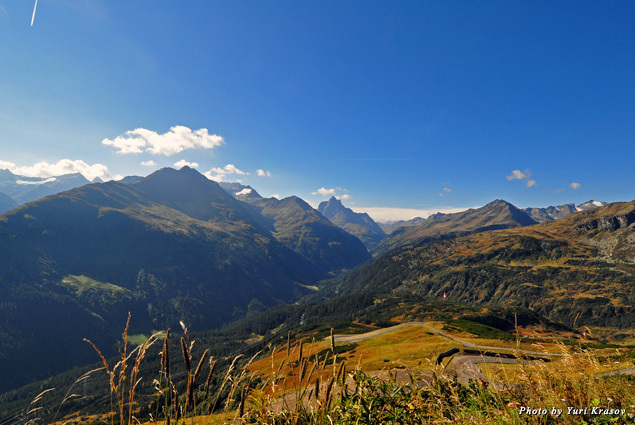 “Das Tirol Panorama” is a massive realistic painting dedicated to the battle of Bergisel Hill under a peasant leader Andreas Hofer against the Bavarian and French occupiers during the Tyrolean Was of Independence in 1809. Late in the evening, we settled in the recently renovated Grand Hotel Europa. A multi-course dinner at the hotel restaurant, Europa Stueberl, consisted of regional specialties such as beef broth with liver dumpling, boiled beef with spinach and potatoes, and Tyrolean dessert of knoedle (dumplings filled with plum jam). 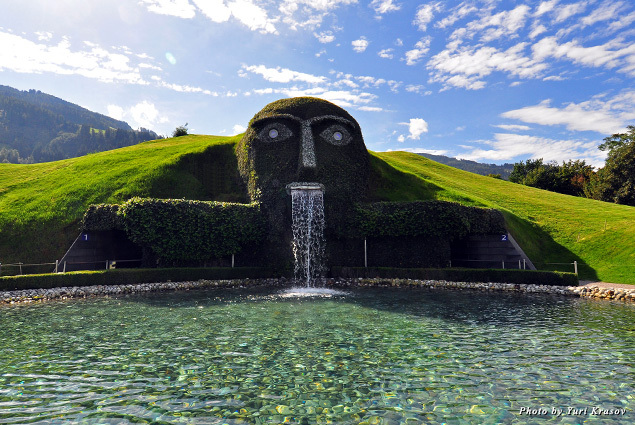 A bus ride away is the Swarovski Kristallwelten, a lavish display of all things shiny from the world’s leading manufacturer of cut crystal. Coming from Bohemia in the 1880s, the Swarovski brothers found an ideal place for their sparkling product at the foothills of the Austrian Alps. Artists from Salvador Dali to Andy Warhol used Swarovski crystals in their art, and their remarkable artwork is on display today, as are a number of site-specific exhibitions that change every several months. In Kufstein, by the Kaiser mountain range, we were just in time for the annual cattle drive. Tyrolean cows, which spend all summer in the mountainous pastures, don’t have natural enemies but might perish in a thunderstorm or fall down a steep hillside. 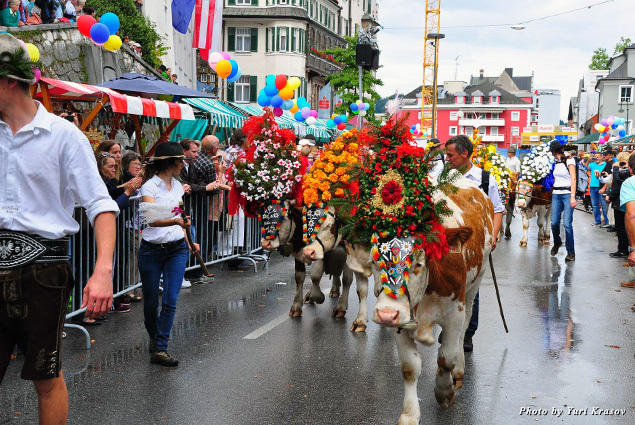 When all cows return home safe, it turns into a big celebration in Tyrolean villages. A herd of well-fed brown cows appeared at the end of the street. Adorned with headdresses like Vegas showgirls, they proceeded down the street past the cheering and applauding crowd and playing bands. Long after the cows returned to their owners, the people continued to celebrate with song and dance and schnapps and sausages from the street stalls. We checked in at the new and comfortable Hotel Stadt Kufstein, with fluffy snow-white beds, a great wellness facility, and a beautiful restaurant serving a buffet breakfast. From our room we could see the Festung Kufstein (Kufstein fortress)—a landmark dating from 1205—that soars over the town. It contains a museum of the fortress that used to be a military base, an arena of many battles, especially during the war between Bavaria and Tirol, and a prison in the dark times of religious persecutions and witch trials. Rows of historical buildings along Roemerhofgasse in the old town center surround a pedestrian zone, studded with souvenir shops and quaint little restaurants. We had enough time only for two of the Kufstein restaurants, but both were truly remarkable. At the Hotel Andreas Hofer restaurant, blueberry pancakes Tyrolean-style looked dark blue; they contained more berries than dough and were simply addictive. The oldest restaurant in town, Auracher Loechl, is very popular with the tourists and locals alike and serves Tyrolean specialties such as Kaiserschmarrn. Legend has it an imperial chef accidentally cut up a pancake he was supposed to serve to the Emperor Franz Joseph. He masked his mistake with rum, raisins, and powdered sugar, and since then the dish has acquired notoriety and popularity. 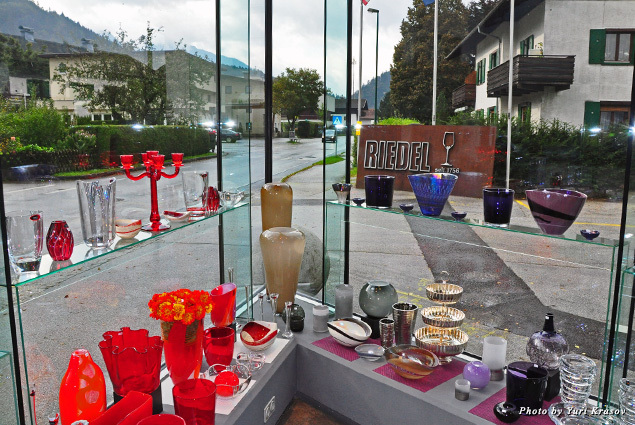 The Riedel Wine Glass Factory in Kufstein is world-famous. From a gallery, visitors can observe a team of skilled glassblowers in white shirts and sunglasses moving in front of the red-hot ovens, transporting bubbles of flaming liquid from one work station to another. They create delicate pieces of glass art, cherished for their incomparable beauty.